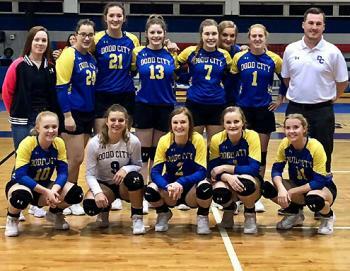 Gainesville -- After winning district and drawing a bye, the Dodd City Lady Hornets made their entrance into the playoffs in dramatic fashion Thursday evening by sweeping Gold-Burg in an area round match played at North Central Texas College. Dodd City turned back Gold-Burg 25-18 in the first set and then overpowered its opponent, 25-4 and 25-11, in the next two sets for a sweep. Sarah Brent and Journie Hilliard both finished with 14 kills, Cassandra Woodlee had a pair of kills and Tori Dotson put down a kill, with Delaney Pilliod passing out 31 assists to the Lady Hornet hitters. Woodlee had a team-high six aces and Camryn Hubbard contributed five aces. Hilliard led the defensive effort with seven blocks. Kylee Graves came up with three digs and Paizley Vaught had a pair of digs. With the victory, the Lady Hornets earn the right to take another step deeper into the playoffs. 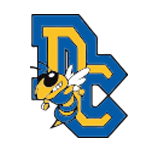 Dodd City will play Bryson on Monday, November 5 in Lindsay at 6:00 p.m. in the regional quarterfinals.